This is your chance to experience the joy of car-free streets, where you can walk, cycle, skate, play, dance, explore and connect with friends, family and neighbours. Partnering with Open Streets on a day when the streets are closed to motorised transport and open to people is part of the GTP’s strategy to build a connected community in Bellville. 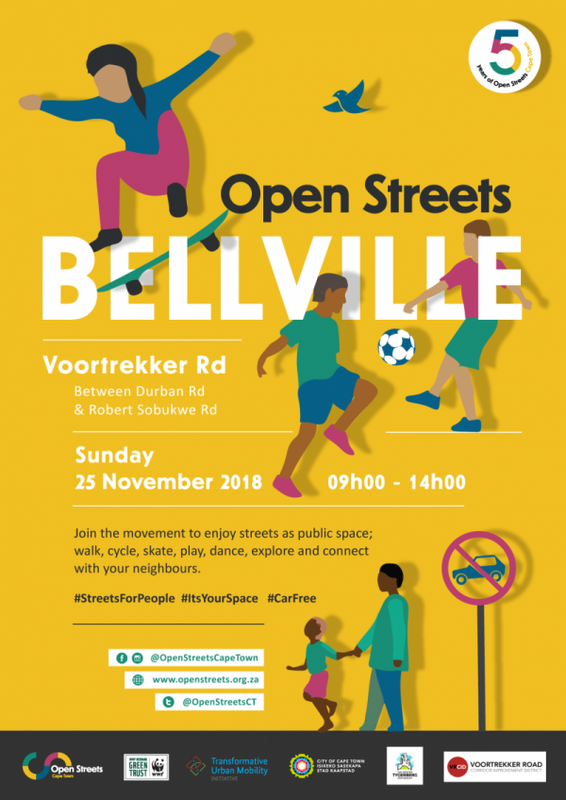 The Open Streets concept has already proved highly popular in Bellville since it first came here in 2015, bringing our diverse communities together. Open Streets is all about sharing streets as public spaces, so people are encouraged leave their cars at home and to walk, skate or cycle to the route on the day. The Open Streets organisers are leading a bike bus on the day from the southern suburbs, and the Bellville public transport interchange is perfectly placed for people who want to use public transport. Voortrekker Road will be closed to cars between Durban Road and Robert Sobukwe Road, and open to people for the packed programme of activities from 9.00am to 2.00pm.